A more recent photo from the air. 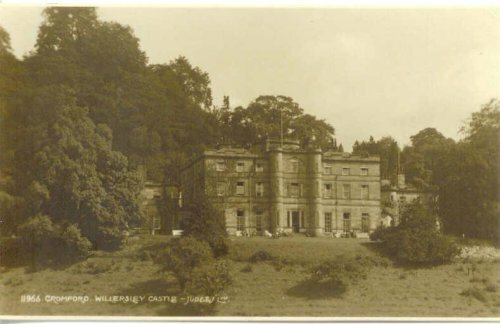 WILLERSLEY CASTLE, Cromford, was built in 1789/90 for Sir Richard ARKWRIGHT, who had purchased the Manor of Willersley in 1782. He was the cotton manufacturing entrepreneur, who had built his first cotton mills at Cromford about 1770. His work for the British cotton industry earned him a personal fortune and a Knighthood in 1786. 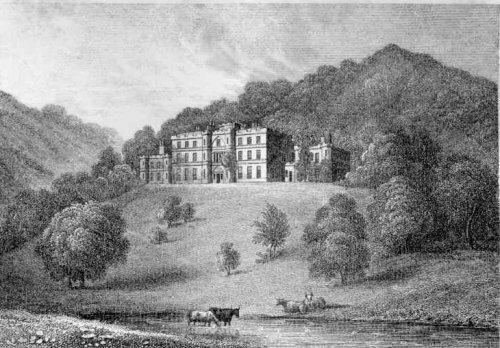 He employed the Welshman, William THOMAS, as his Architect, who designed a picturesque house in classical style to suit the grandeur of its commanding position on the hills overlooking the River Derwent. 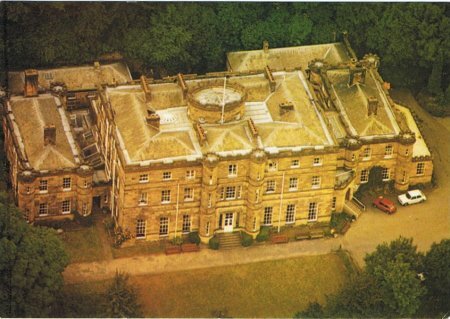 While it was still being built, and the ARKWRIGHTs were living at the Rock House across the river at Cromford, the new house was completely gutted by fire on the night of 8th August 1791, and Sir Richard died a year later before he had ever lived in it. 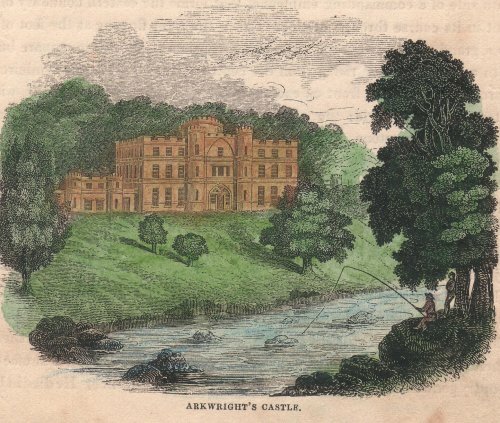 However, it was rebuilt (to designs by Thomas GARDNER and the locally-born Edward BLORE) and enjoyed by his eldest son, another Richard ARKWRIGHT, and then by his third son Peter and his descendants. However, Peter ARKWRIGHT's great-grandson did not wish to live there, and it was sold in 1936 to the Wesley Guild, who in 1991, still continued to run it as a conference and holiday centre. 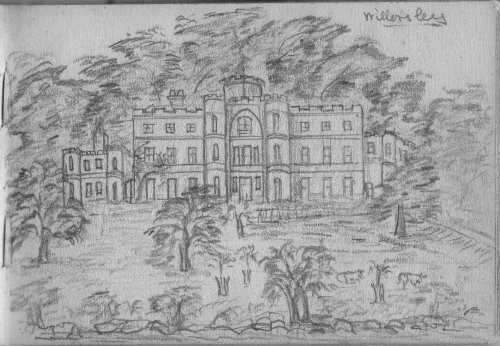 Willersley Castle, the noble home raised with his well-earned wealth, stands on the south side of a commanding eminence, that forms the eastern boundary of the Derwent in its course through Matlock Dale: the river flowing at the foot of the hill, in a grand sweep eastward. The castle consists of an oblong, square building, with a circular tower rising from the centre of the roof, and a semicircular tower projecting from the front on each side of the entrance; and two wings, with a round tower at each angle: the whole structure is embattled, and the exterior walls are of white freestone. I have just found your web pages about Willersley and wanted to correct you on the date the Wesley Guild purchased the Castle. It was bought in 1928 and opened for business on 28th May 1929. The company now trades under the name Christian Guild Holidays and celebrated 75 years as a Guild Hotel and Conference Centre.